Amy Nelson sat on a dock at the edge of a huge sheet of ice, about to take a break from work. "I'm going to go skating on Lake Minnetonka, as far as I can go in the allotted time I have," she said, as she laced up a pair of white figure skates Wednesday afternoon. "It's a balmy 19 degrees, but it's super sunny and just absolutely gorgeous." Over the weekend, Nelson and her son met several people in Wayzata, who just skated about 5 miles across from Excelsior. "And we asked them, 'Was it safe?' and they said, 'Oh yeah!' so I decided this week — I was going to do it," Nelson said. She's not alone. 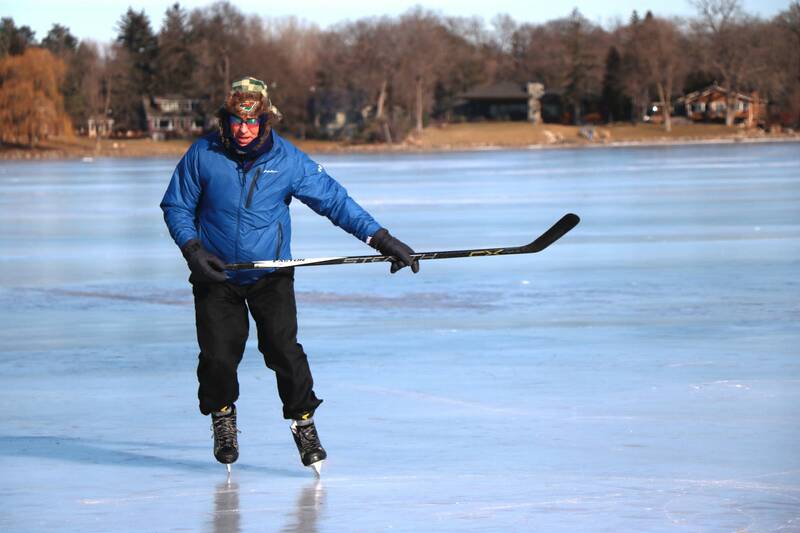 Even in the middle of a weekday, you could see dozens of skaters from the shores of Lake Minnetonka. They were enjoying near perfect conditions not seen in years — clear, smooth ice without snow on top. 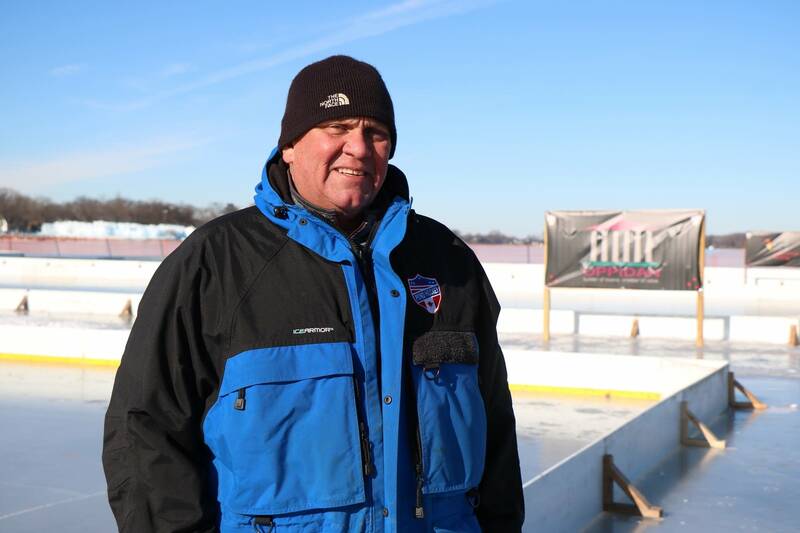 Just off the docks at Maynard's Restaurant, Tim Jenzer and a few other volunteers put up banners next to a series of rinks on the lake for the North American Pond Hockey Championship, which starts Friday. "This is one of the best years we've had for natural ice conditions," said Jenzer, the ice director for the tournament. "In 2016, we only had 8 inches of ice on the lake so we never set anything up at all and turned it into a complete bean bag tournament." And last year, rain ruined otherwise decent ice conditions forcing another cancellation of the pond hockey championship. Jenzer said he measured Lake Minnetonka's ice at about 16.5 inches last week, stable enough for the 80 teams competing in the tournament and the thousands of fans throughout the weekend. In the Twin Cities metro area, many lakes have similar conditions, but that doesn't mean people should stop checking ice depth. "Ice is never 100 percent safe and certainly doesn't always freeze uniformly," said Minnesota Department of Natural Resources spokesperson Joe Albert. "But in the Twin Cities and south, there's not a lot of snow on the ice. That helps ice formation because there's not that insulating layer. Albert added that farther north, where more snow has fallen, "we're really running into issues with slush on top of the ice and people having a hard time getting around." Out on Excelsior Bay, Gordie Roberts, who won two Stanley Cups with the Pittsburgh Penguins and played for the Minnesota North Stars, skated with two friends passing a puck around. "Instead of going to the gym, riding the bike, I'm out here skating on the lake," Roberts said. Dan Strot, a former North American Hockey League scout, glided alongside. He grew up in Deephaven, on the shores of Lake Minnetonka. "I remember when I really young, probably the later 50s, we'd get winters like this," Strot said. "And I can't remember too many since then where you could skate pretty much the whole lake." He said that doesn't mean the skating is without hazards. "On a big lake like this, you got to keep your head down and watch out for the cracks," he said. "And the ice fishing holes." The North American Pond Hockey Championship runs through Sunday.